5 July, Rome — The FAO Yearbook of Forest Products, which marks its 70th anniversary with the publication of the latest edition, has provided a compilation of statistical data on the production, trade and consumption of forest products since its launch in 1947. An important foundation for evidence-based forest policymaking, the yearbook is used to set milestones for socioeconomic development in many countries. The latest edition includes annual data on the production and trade of forest products, including data on quantity and value. With seventy years of consistent data collection, the yearbook allows progress to be monitored in individual countries, across regions, and globally, and for projections to be made for future development. The full series of forest products data, starting in 1961, and covering 55 categories and 21 product groups from 245 countries and territories, is available on the FAO Forestry website. The yearbook’s statistics rely extensively on the cooperation of governments, which supply most of the information via a joint questionnaire supported by a consortium of organizations, including FAO, the International Tropical Timber Organization (ITTO), the United Nations Economic Commission for Europe (UNECE) and the Statistical Office of the European Union (Eurostat). Originally published in English, the yearbook has been produced in Arabic, Chinese, French and Spanish since 1998, and a Russian version was added in 2011. Readers include members of the private and public sector, and are also drawn from academia. 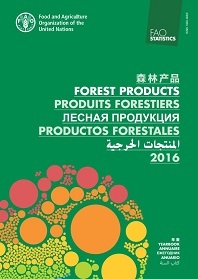 In 2017, more than 120 000 online users from more than 180 countries and territories worldwide consulted FAO’s forest products statistics and related publications.